A new security alert issued on Kenya by the US was justified, an embassy official said yesterday. Deputy ambassador Leslie Rowe said the US government had a duty to warn its citizens on any terrorism threat and denied accusations that one of their security advisers triggered panic by running around hotels issuing reports of fresh attacks. "We indeed shared all the information we had with the Kenya Government and at no time did we do anything in isolation," she said, after presiding over the swearing in of 49 US peace corps volunteers in Nairobi. Furious Government officials accused the embassy of reacting hastily and said they were considering sending a formal protest to the US government. Cabinet ministers Kalonzo Musyoka (Foreign Affairs) and Raphael Tuju (Tourism) sought to reassure the international community that Kenya was a safe tourist destination. Mr Kalonzo asked the international community to study carefully the situation in Kenya before issuing travel advisories. Ms Rowe said the embassy had not issued a fresh warning on terror threats in Kenya apart from the one issued earlier, which asks American citizens to avoid visiting the country. US on Wednesday requested its citizens in Kenya to keep off the Hilton and the Stanely hotels, which it said could be terrorists' targets. The alert prompted the government to react swiftly tightening security in major buildings and putting more policemen on day and night patrols. "We are happy with the security measures the government has so far taken and with total co-operation, the war on terrorism will be won," she noted. 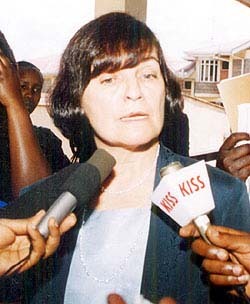 Despite the alert, Ms Rowe said America still considered Kenya a major partner in the fight against the menace. She said the visiting of US Health and Human Services secretary Tommy Thompson to the country showed the confidence America had in Kenya. Mr Thompson was in Kisumu yesterday visiting various Aids projects. Mr Tuju issued a statement on Wednesday night assuring foreign visitors and tourists that Kenya was safe and they had nothing to fear following Tuesday's terrorist bomb scare.